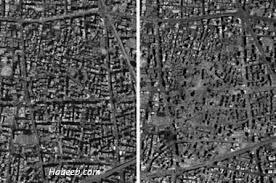 No, Israel Should Not Flatten Beirut: A debate over whether Israel should commit war crimes and wipe out a city of at least 1 million people is somehow acceptable. The short answer is yes — but we’ll get to that in a minute. The fact that Israel has already flattened large sections of Lebanon, in Beirut and beyond, would seem to make the article’s title a bit redundant. Who, you may ask, is the fellow who has taken it upon himself to ponder this important matter? As it turns out, Etzioni is . . . a professor at the George Washington University in Washington, D.C., having formerly taught at other prestigious U.S. universities including Columbia and Harvard. Also on his CV are stints of service in the Palmach militia, which fought for Israeli “independence” until 1948, and the Israeli military. Etzioni begins his philosophy session with a claim from an anonymous “Israeli representative” in D.C. that Hezbollah’s alleged stockpile of “100,000 missiles [is] now Israel’s number two security threat,” second only to a nuclear-armed Iran. Never mind that Hezbollah has never started raining anything on Israel without serious provocation — or that civilian casualties generally haven’t been at the top of that country’s list of concerns. He goes on to caution, however, that “many studies have shown that such bombing … do not (sic) have the expected effect, nor did it in 2006 (assuming that such bombing actually occurred).” Indeed, when I myself visited Shia and other varieties of Lebanese neighborhood a month after this particular war, it still wasn’t clear from the ubiquitous rubble—and craters in the ground where buildings had once stood—whether “such bombing” had actually transpired.